Creating Value throughout your project. Creating value through Offsite/OffShore Delivery model is one of the brightest aspects of Tech Receptives. 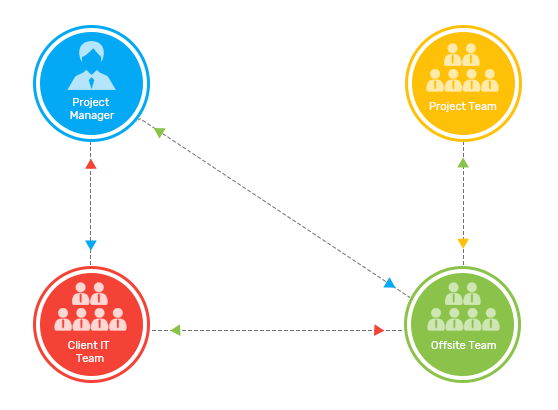 The Offsite/Offshore Model works great for clients looking to outsource their work to OffShore team. The Offsite acts as a mediator, between the acting base and the OffShore team providing valuable inputs to the success of the project. Benefits of using Offsite/Offshore Delivery Model are increased productivity with a clear vision and planning to go ahead. The distribution of the work also enables teams to work efficiently without work burnout. Another important benefit of using the model is 24/7 working, bringing more opportunity to the client's project. With this model, outsourcing also becomes more viable with decreased cost and more control over the whole process including development, maintenance and market research. At Tech Receptives, we start with clear requirements and always enable clients to be in charge of the whole process. We are completely reflexive around the requirement and incorporate necessary changes whenever needed. To get maximum benefits of the Offsite/Offshore Delivery Model, Tech Receptives provides a laid-out plan for the whole implementation, bringing fast response and returns from the start.